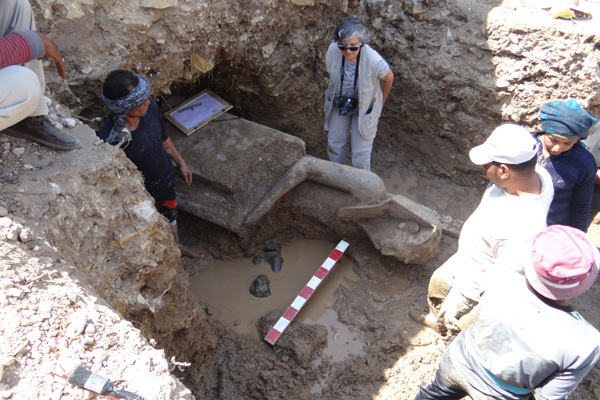 The Colossi of Memnon and Amenhotep III Temple Conservation Project has discovered a magnificent statue in black granite representing king Amenhotep III seated on the throne. 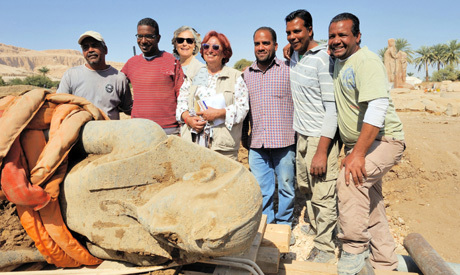 Project director Hourig Sourouzian told Ahram Online that the statue is 248 cm high, 61 cm wide and 110cm deep. It was found in the great court of the temple of Amenhotep III on Luxor's West Bank. "It is a masterpiece of ancient Egyptian sculpture: extremely well carved and perfectly polished," Sourouzian said, adding that the statue shows the king with very juvenile facial features, which indicates that it was probably commissioned early in his reign. 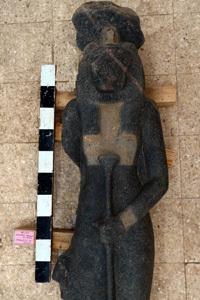 A similar statue was discovered by the same team in 2009 and is now temporarily on display in the Luxor Museum of Ancient Egyptian Art. When the site's restoration is complete, Sourouzian said, the pair of statues would be displayed again in the temple, in their original positions. 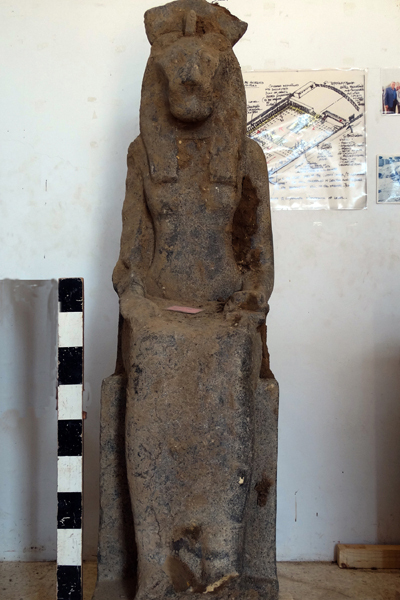 Mahmoud Afifi, head of the Ministry of Antiquities Ancient Egyptian antiquities department said the team has discovered up to 66 parts of statues of the goddess Sekhmet this archaeological season. These statues represent the goddess sitting or standing holding a papyrus sceptre and an ankh — the symbol of life. On many of these statues the goddess' lion head is preserved. Other pieces include busts, heads detached from their bases, as well as several other parts. Sourouzian said this series of statues was found during excavation between the ruined temple's Peristyle Court and the Hypostyle Hall, as archaeologists searched for remains of the wall separating the two areas. 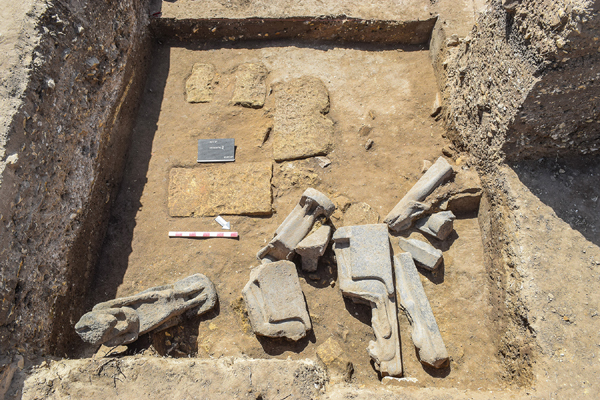 "The sculptures are of great artistic quality and of greatest archaeological interest, as they survived extensive quarrying of the temple remains in the Ramesside Period, after a heavy earthquake toppled the walls and the columns," she told Ahram Online. As her name indicates (derived from Sekhem, meaning "might"), the lion-headed Sekhmet is a powerful goddess who protects the sun god against his enemies. King Amenhotep III commissioned hundreds of statues of the goddess for the temples he constructed in Thebes. In his funerary temple particularly, which was called the "temple for millions of years," the great number of these statues was intended to protect the ruler from evil and repel or cure diseases. "All of these statues of the goddess will be placed back in their original setting as soon as the site is restored," Sourouzian said.